There is, however, some doubt about the dating of the 1769 line. According to a paper by Isasksson et al in 2004, the 1769 sea ice edge is actually for August, and not April. Herein we document findings from a unique scientific expedition north of Svalbard in the middle of the polar night in January 2012, where we observed an ice edge north of 82°N coupled with pronounced upwelling. The area north of Svalbard has probably been ice-covered during winter in the period from approximately 1790 until the 1980s, a period during which heavy ice conditions have prevailed in the Barents Sea and Svalbard waters. However, recent winters have been characterized by midwinter open water conditions on the shelf, concomitant with northeasterly along-shelf winds in January 2012. The resulting northward Ekman transport resulted in a strong upwelling of Atlantic Water along the shelf. We suggest that a reduction in sea ice and the upwelling of nutrient-rich waters seen in the winter of 2012 created conditions similar to those that occurred during the peak of the European whaling period (1690–1790) and that this combination of physical features was in fact the driving force behind the high primary and secondary production of diatoms and Calanus spp., which sustained the large historical stocks of bowhead whales (Balaena mysticetus) in Arctic waters near Spitsbergen. Whalers Bay, as mentioned by Isaakson, lies at 81N, so this basically the same area that appears to have been ice free in winter between 1690 and 1790. This would therefore appear to confirm the Polar Institute’s version of events. Note that the edge of the summer sea ice was even further north than recently in the early 18thC. 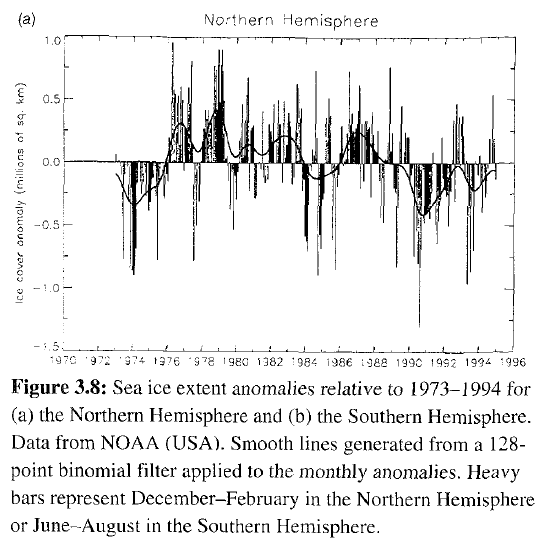 (Bear in mind that the paper was written in 2002, but summer ice extent near Svalbard has changed little since then). Graph A shows the position of summer sea ice edge, and again we find some years in the early 18thC at similar latitudes as recently. European whaling commenced in the early 1600 s and was initially focused on the Spitsbergen bowhead whale stock (Fig. 1). The peak of the Spitsbergen whaling period, between 1680 and 1790, coincided with an era during which the minimum (August–September) ice edge was north of 80N for extended periods, a situation similar to that observed during the last 15 years (Fig. 2). The subsequent near extinction of these whales coincided with a period of rapid expansion of the autumn ice edge from around 1790, when the border of the minimum sea-ice cover expanded some 500 km southwards to around 76N within a few years (Fig. 2). The Spitsbergen bowhead stock has been estimated to have numbered as many as 100,000 individuals before whaling started (Reeves 1980; Allen and Keay 2006). By the end of the whaling period, around 1800, the Spitsbergen bowhead population had been hunted to near extinction (Woodby and Botkin 1993). The species was very attractive for early whalers; bowheads were valued both for their baleen and for the oil content of their huge blubber deposits, which was used both for human consumption and for lamp oil. The oil was so valuable that Amsterdam ship owners sent their whaling ships northwards into hostile arctic waters northwest of Svalbard for over 100 years. Regardless of the 1769 dating issue, it is evident that there have been very large swings in sea ice extent during the last 300 years. Finally, I should point out the eruption of the Icelandic Laki volcano in 1783 was one of the key factors in the colder climate that arrived at that time. Thanks for an interesting read, Paul. I have read most of the things you refer to quite a while ago, so it was a nice refresher. What I’m missing a bit when reading about the high variability on the Atlantic side of the Arctic, is how all these wild swings compare to the (recent) present. Not only can you sail quite a way past Svalbard, but there’s open water (or at least, very low concentration ice) all the way to Franz Josef Land! I’ve been looking at the Arctic for quite a while now, but haven’t seen anything close to it at this time of year. Mind you, the Arctic sea ice cover is close to reaching its maximum extent, and so I don’t expect things to change all that much. In fact, there’s another month to go until April, so under the right circumstances (winds, temps) the ice edge could even retreat some more. Now compare that to the image at the top of your blog post, which shows the ice edges of average Aprils, I assume. Except for 1769, of course, which is highly likely the ice edge in August. It’ll be interesting to see what August will look like this year on the Atlantic side of the Arctic, given the current, somewhat spectacular situation. So What.. Nowhere near as low as during the first 3/4 of the Holocene. The piddling little time you are referring to is immaterial and irrelevant. Also happens to be on the upward leg of the AMO and the tale end of the small rise out of the LIA. 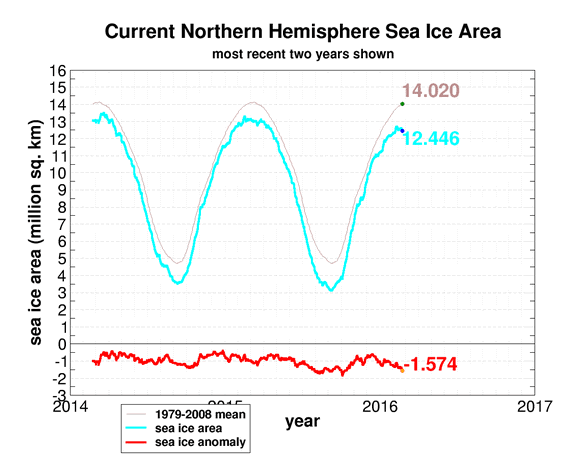 The time to start to worry about Arctic sea ice is when it starts to increase again !! And of course Neven forgets that satellite monitoring of sea ice began in 1973 as IPCC admitted in 1990 WG I p. 224 and 1196 WG1 p 150. Heck they even admitted in 1996 that there were no trends and showed 1973-74 clearly below 1996. Funny how that knowledge has been discontinued also. That’s great, but can you quantify what you are saying? I’m all for talking about variability in the past, but how does it relate to what happens now? We know nothing if we do not compare. Actually, the first satellite images of Arctic (and Antarctic) sea ice are from 1964, made by the Nimbus-I satellite, followed by Nimbus-2 and -3, covering 1966 to 1972. But regular, daily mapping mapping from space did not begin until 1978.
and showed 1973-74 clearly below 1996. Have you found any images from March-April 1973-1974 so we can compare to the current situation. I’d be especially interested to see where the ice edge was back then on the Atlantic side of the Arctic. I’m willing to spend some time and look into this with you. Neven, don’t play stupid. I gave you references, now go and read. Of course, I’m willing to read, but can you assure me that I will find images or data that I can then use to compare to the current situation (apples to apples)? Tony Heller/Steven Goddard spliced graphs from those early IPCC reports to existing satellite era long-term graphs, not apples to apples in various respects. I don’t know if you’re basing yourself on that, but I hope you’re not, as it is erroneous, and as Goddard is involved, probably deliberately misleading. I’ll go and read now. The American Navy Joint Ice Center has produced weekly charts which have been digitised by NOAA. These data are summarized in Figure 7.20 which is based on analyses carried out on a 1° latitude x 2.5° longitude grid. Sea-ice is defined to be present when its concentration exceeds 10% (Ropelewski, 1983). Since about 1976 the areal extent of sea-ice in the Northern Hemisphere has varied about a constant climatological level but in 1972-1975 sea-ice extent was significantly less. It’s not entirely clear to me to what time of the year is referred. September, all year round? That’s one. Secondly, figure 7.20 is showing anomalies, and apparently the anomaly somewhere between 1972 and 1975 was almost 1 million km2 lower than the average. Of course, the average back then was much higher than the average that is used now (base period is 1979-2010 most of the time). My interpretation of your comment is that you are claiming that what is happening now isn’t so uncommon because similar things happened in the years preceding daily satellite monitoring of sea ice. Your reference from FAR in no way shows this, unless you care to explain and quantify. I will now look at the passage you refer to in SAR 1995. So, the base period is 1973-1994. I would say the dip in 1974 – which might very well be for February – is approximately 0.8 million km2. Now, using a base period of 1979-2010 would probably reduce this anomaly further, because the average of 1979-2010 is definitely lower than 1973-1994, but quantifying how much exactly isn’t straightforward. So, let’s just go with 0.8 million km2. That’s almost double the anomaly of February (?) 1974. Of course, this is sea ice area anomaly, and the one for the SAR figure is for sea ice extent anomaly (10% threshold if they didn’t change it since FAR). Like I said, it’s not that easy to make apple-to-apple comparisons, so splicing graphs together like Goddard did, is highly misleading. To conclude (for now): it seems that Arctic sea ice in the 70’s at no point even approached what we are seeing right now. Of course, we can quantify further if we can find the research papers that those figures from FAR and SAR come from, or we could perhaps look at NIC ice charts to see where the ice edge was in the North Atlantic during Feb-March in the 70’s. But only if you feel like it and are willing to put some work and thought into it as well. I seem to be the only person here who actually puts forward arguments (with links) and explains them. As said in the caption, the black line is for Nordic Seas sea ice area in April (Vinje 2001). The line never goes below 1.3 million km2. Now, if I add up current SIA values for the Barentsz and Greenland Sea I get 0.525 million km2. Quite the difference. We’re seeing something unusual happening on the Atlantic side of the Arctic this year so far, unusual even compared to recent years, not seen in the satellite record and probably a long time before that (between now and the Holocene Climatic Optimum).